Click here to visit the website devoted to the development of a new regulation that transitions TRUs to zero-emission technology. (March 1, 2017) ARB Executive Order G-17-004 made changes to the Proposition 1B Final Guidelines for Implementation (Program Guidelines), which may benefit refrigerated fleets and grocery store chains that use TRUs for cold storage behind grocery stores. Click here for further description of these changes. 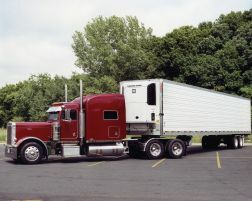 Transport Refrigeration Units (TRUs) are refrigeration systems powered by diesel internal combustion engines designed to refrigerate or heat perishable products that are transported in various containers, including semi-trailers, truck vans, shipping containers, and rail cars. Although TRU engines are relatively small, ranging from 9 to 36 horsepower, significant numbers of these engines congregate at distribution centers, truck stops, and other facilities, resulting in the potential for health risks to those that live and work nearby. Since diesel particulate matter has been identified as a toxic air contaminant, the ARB adopted an Airborne Toxic Control Measure (ATCM) for TRUs and TRU generator sets on February 26, 2004 with amendments in 2010 and 2011. Please see more information about this rulemaking is at: 2004 TRU ATCM Rulemaking, Rulemaking and Final Regulation Order with 2010 Amendments, TRU Advisory 10-20, TRU ATCM 2011 Regulatory activity,. TRU Regulation - Click here to view the current TRU regulation. Technology Assessment - Click here to view the technology assessment for transport refrigerators. If your TRUs are based in California, you are required to register your TRU with the California Air Resources Board. The deadline for registration of existing units was July 31, 2009. New units must be registered within 30 days of the unit coming into the control of the owner. You are strongly encouraged to apply for California Air Resources Board Identification Numbers (IDN) electronically, on the Internet, using the Air Resources Board's Equipment Registration (ARBER) system, since this is the fastest way to register. If you are the owner of a TRU that is based outside of California, applying for an IDN is voluntary and there is no deadline. Electronic Registration Instructions and Help Page: Please start at the ARBER System Requirements webpage to make sure your computer system is compatible, specifically, that your web browser is the latest version. Then, read and follow the instructions at the following link: ARBER TRU Registration Help Page. Electronic Registration Login: Login to complete online electronic applications for ARB Identification Numbers (IDN): ARBER Login Information submitted must be true, accurate, and complete. Within 30 days of a change in ownership or compliance status, the new information must be entered in the ARBER system. This includes updates to the company profile and primary contact information. Failure to report updates or submittal of false information is a violation of state law subject to civil and criminal penalties. Bulk Registrations (Batch Uploads): This process allows TRU owners to transmit hundreds to thousands of registrations in one file for processing ARB IDN applications and Operator Reports. You will need a programmer very experienced in XML programming to prepare the file. Please see the Batch Upload Help Page for details. If you do not have the appropriate technical skills in-house and are only planning to submit a small number of registrations, we highly recommend that you use the ARBER electronic registration system (see above). Please apply for IDNs or obtain them from your leasing agent prior to attempting an Operator Report. If you operate a terminal in California where you garage, maintain, operate, or dispatch TRUs, you must comply with the Operator Report requirements of the TRU ATCM. Currently the ARBER system does not accept Operator Reports without inputting at least one ARB Identification Number (IDN). ARBER will not issue an IDN for a noncompliant engine. You must update your Operator Report within 30 days of receiving your IDN. Sign up for the TRU listserve: TRU Listserve.